I was wondering does anyone have a fleet roster for Saint John transit ? I know they have lots of Classics, 5-10 Orion VII`s, a few RTS and I think they only have one Fishbowl since I only spotted one in the week I was in Saint John. As of 2004 they had 12 fishbowls, 5 RTS, 2 Orion V's, 30 Classics, and 1 Orion VI. I think since then they got Orion VII's and more. I'm sure the roster has change a bit since. I did not see any of the V`s or the 1 VI while I was there is it possible they retired? I doub`t there is still 12 Fishbowls in service since I only spotted one, maybe they use them more during the school year. The fishbowls are most likely not seen during the summer. The 2 Orion V's were aquired brand new in 2002 and the 1 Orion VI was aquired used in 2003. So, I doubt the Orion V's and VI are retired. Those 2 Orion V's are actually 2 Orion VII's that Saint John Transit bought 41252 and 41253. I saw 41252 at the garage when I visited Saint John, 41253 was sent out for engine work during my visit so I never saw that unit. The lone Orion VI 32754 was also seen active in the garage when I visited. As for the fishbowls running when I was there 8116, 8117 and 8119 ran during the AM and PM rush, but I don't know if they kept running for the rest of the summer. Saint John Transit has a large number of spare buses sitting around in the garage, even during rush hour. How many Orion VII`s does Saint john have to date? When I was there at the beginning of the month I noticed all the VII`s were wrapped. 32754, 41252 and 43253 were all in the same red and white Saint John Transit livery. The rest of the 2004-05 Orion VII's were wrapped when I visited Saint John. Don't know if they managed to wrap up 41252 and 43253 since then. How does the fleet numbers work for Saint John Transit? I don`t understand how they chose 41252 for a 2002 VII. How does the fleet numbers work for Saint John Transit? I donb`t understand how they chose 41252 for a 2002 VII. Yes it very weird, but this is how its broken down. For 41252: 41 is the number of seats, 2 is the last number in the year it was built (in this case 2002), and 52 is because its the 52nd bus in the fleet. Indeed very confusing for someone like me who was unaware of this, but give it a day and you'll get used to it. 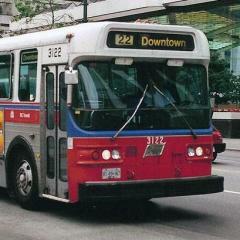 Was 41252 equipped with an electronic destination sign like the TTC Orion VII's? Does anyone have any info on Saint John #'s 47303 and 47401? I believe 47303 is a 1983 GM Classic and #47401 is a 1984 GM Classic. Does anyone know where these two untis originally came from? Does anyone have an updated fleet roster? My wife and I are most likely going there on the third week of August to visit her stepfather. They kept in touch after her mother's passing on May 29th, 2005 from breast cancer at 51 years of age (my wife first knew him when she was 12). So I'll have a chance to go take photos most likely at McAllister Mall and King Square. Also there's route 17 which passes on Gloden Grove Rd, the street where he lives, so another photo op there. Also, I am going to send an e-mail to the City of Saint John to ask permission to go take photos of their buses at the garage. yes , last 3years we trtired all the gm fishbowl,, we still have calassic, and orion vii low floor old look ,, orion vi, and orion vii new look.. .. also ,2 nova lfs artics ,,so ,welcome saint john ,this summer take pictures. Thanks. We wanted to go last year, but we felt our little one was too young for a 10 hour drive. We're going during the week of August 15th this summer. The 2 LFS Artics are ex. Nova demo 40881 and 40882. They were tested here in Montreal, Longueuil, Quebec and Gatineau. Saint John Transit's 1st of 2 LFS Artics. Hello. Just want to add this link (a CPTDB link actually), that I found. It is a bit out of date (the routes and numbers have been changed as of this past Aug '09), but gives all fleet numbers. Just one mistake I noticed: The 2 artics are numbered correctly, but the newest Orion's should be 44980, 44981, & 44982. You can ask the admins to add you as a Wiki Editor. Had the pleasure of visiting Saint John on Thursday March 31 and a bit on April 1. I only was able to find one of the five RTS listed on the wiki, found it twice #46849. Lots of Orion VII/VII NG and Classics for me to photograph, found one of the LFX as well. Any photos to share? I love Saint John! There certainly will be, I will try to get a few shots from each of the systems processed within the next few days here. I'll post as soon as I can. Nice! Did you ride the RTS too!? Nope, not in Saint John, did in Fredericton though. Got a pretty decent recording there. Will upload it soon. I've uploaded 25 of my photos from my visit to Saint John.